Buy Hazel Tree (Corylus avellana) online from UK tree supplier of cell grown broadleaf hedges and shrubs. A small native, British tree, the Hazel (Corylus avellan) is a feature of the landscape. It is noted for the production of long, dangling lams's tail male catkins in spring. 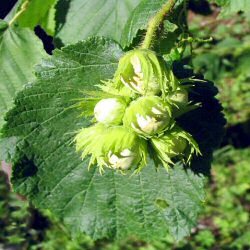 Edible hazelnuts, not just for humans are produced in autumn. Commonly coppiced, that is cut down and used in fence production, the resulting trees are multi-stemmed. Left untrimmed, Hazel will grow to approximately 8m (27ft). Typically, Hazel is planted in groups of between 10 and 25 trees. This number of trees is ideal for creating a wildlife habitat and a meaningful source of food and shelter. Spacing may vary between 1m (3ft 4in) and 5m (16ft 8in). The aim is to mimic what nature intended and thus avoid artificial lines. Blending of one species into another is suggested although bearing in mind different growth rates. Hazel is a key native tree species and along with the many other native, British tree and shrub species we sell will form part of an attractive native woodland.